A more recent breed, the Silken Windhound was created primarily as a companion, although like most sighthounds they excel in coursing. Unlike many breeds, the history of the Silken Windhound is fairly well documented. They were created in the late 1980s by Francie Stull of the Kristull Borzoi Kennels in Austin, Texas. She desired a small sighthound with a long coat and as no standardized breed of this type existed she chose to create her own. 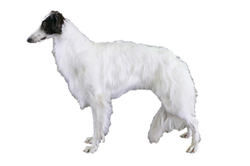 Beginning with a group of Longhaired Whippets (a debate still rages on if these dogs are pure Whippet or crossed with herding breeds to obtain a long coat) from the Windsprite Kennels she added Borzoi and a single short coated Whippet to her bloodlines. The Silken Windhound was officially accepted by the United Kennel Club in 2011, the first major kennel club to do so. Is the Silken Windhound Right for You?